Leawo iTransfer is a powerful tool for you to use to realize iPhone ringtone download for Android. 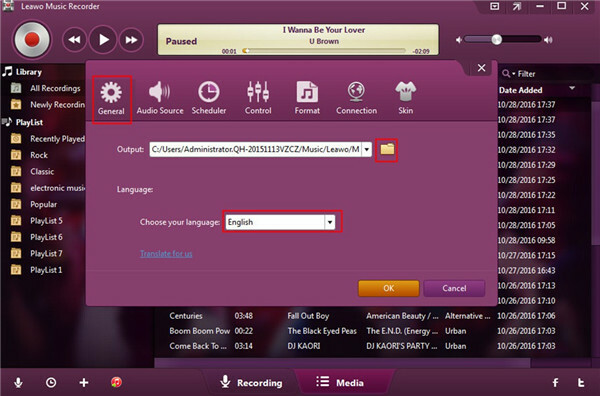 You just need to use iTransfer to move the iPhone ringtones to PC and convert it to MP3 with Leawo Music Recorder. Afterwards, you can copy the ringtones in the format of MP3 to your Android. 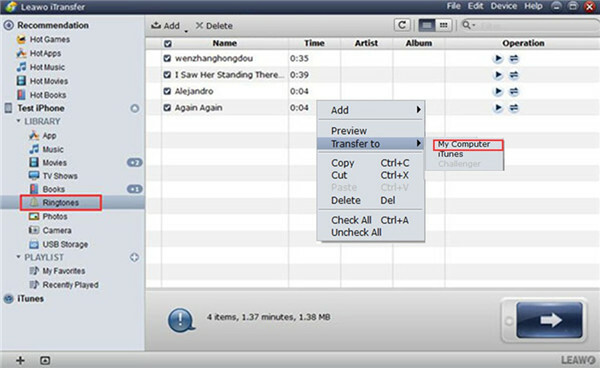 iTransfer can manage up to 12 kinds of files among computers, iTunes and iDevices. It is quite useful to transfer iPhone ringtones to Android. The detailed steps to transfer Apple iPhone ringtones for Android are shown below. Run Leawo iTransfer on PC and then connect iPhone with PC with suitable USB cable. The tool will recognized your iPhone automatically to prepare to download iPhone ringtone for Android. Go to “iPhone icon > LIBRARY > Ringtones” to view all ringtones on your iPhone to continue to solve how to transfer iPhone ringtones for Android. Choose the ringtones you want to transfer to PC and then right click on one of them. After that, you need to choose “Transfer to > My Computer”. In the pop-up panel, you need to click “Change” button to navigate to a location on your PC to save the exported iPhone ringtones. Afterwards, you need to tap “Transfer Now” to begin to export them to your computer folder. When this process is over, you will be able to check out the iPhone ringtones on your computer. 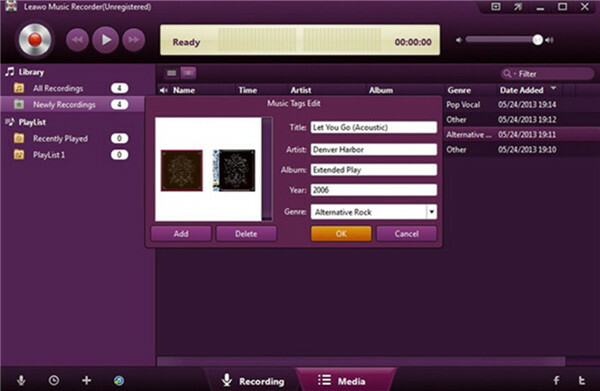 Open Leawo Music Recorder on your computer and then convert the M4R to MP3 for later use. (As for the detailed steps on this conversion, I will show them to you in Part 2.) After that, you need to connect your Android to PC and the computer will detect it as an external hard drive. Finally, you can copy and paste the converted iPhone ringtones in the format of MP3 to your Android folder. This solution to realize iPhone ringtone download for Android is simple. You can deal with the problem with iTransfer effectively. 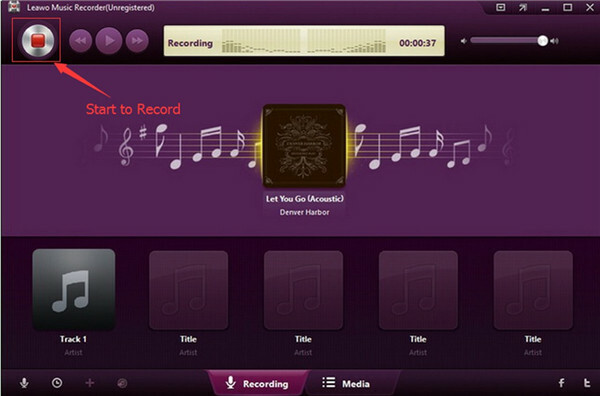 In the process, you also need the help of Leawo Music Recorder. As for how to download iPhone ringtone for Android with Leawo Music Recorder, I will tell you in Part 2. The guidance has shown you how to transfer iPhone ringtones for Android with iTransfer in Part 1. As for how to use Leawo Music Recorder to help you to make iPhone ringtone download for Android come true, you can read the following contents. Leawo Music Recorder is professional and can record M4R and save it as MP3 for your convenience to transfer Apple iPhone ringtones for Android. The following steps will display you how to make it efficiently. After you have used iTransfer to move iPhone ringtones to PC, you need to continue to solve how to download iPhone ringtone for Android by running Leawo Music Recorder on computer. Afterwards, you need to click on the microphone button and then tap “Audio Source” panel. 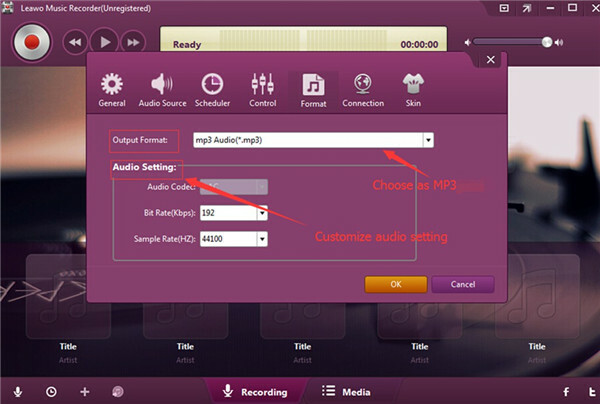 Then you need to choose “Record Computer Audio” if you want to convert M4R to MP3 to solve how to download iPhone ringtone for Android. Click the “Format” option to select “Output Format: mp3 Audio (*.mp3)” for the Android ringtone. You can also set the audio code, bit rate and sample rate in the function area of “Audio Setting” in case you need. 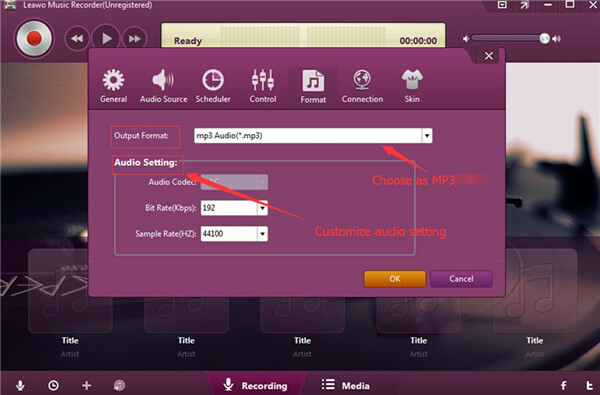 Thereafter, you need to navigate to “General” panel to set the output folder for the recorded MP3 file and select a kind of language you want to employ. 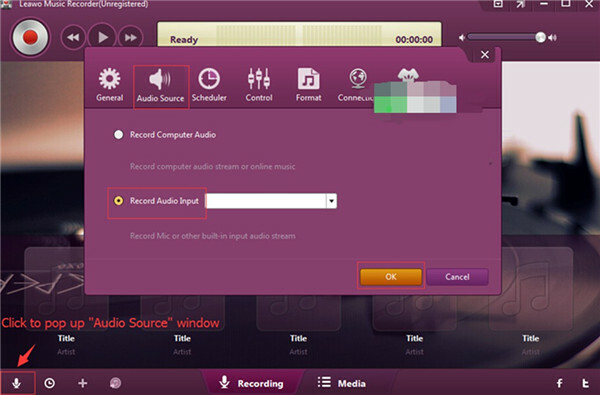 Navigate to the main interface of Leawo Music Recorder and then click on the red button to begin to record M4R and you need to play back the M4R on your computer simultaneously to allow Leawo Music Recorder to record it. When the ringtone is over, you need to click on the red button again to stop the recording process. If you need to edit the info of the MP3, you can right click on the MP3 file to enter into the panel of “Music Tags Edit”. After that, you can change or add tags manually. Finally, you need to click on the button of “OK” to save your settings. After you have recorded the iPhone ringtones to MP3, you can copy the MP3 files to your Android folder on your computer to finish the procedure to transfer iPhone ringtones for Android. This software is very useful when you encounter the problem of how to transfer Apple iPhone ringtones for Android. 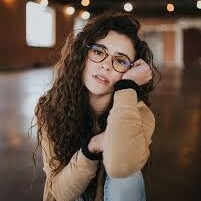 Have a try and you will know how professional it is.